Dinosaurs from the Southern Hemisphere are upcoming north. The Science Museum of Minnesota proclaimed Wednesday it will host the roaming show "Ultimate Dinosaurs: Giants from Gondwana," to open March 1. The exhibit was created by the Royal Ontario Museum in Toronto and includes reconstructions of 20 dinosaur skeletons. But don't expect a Tyrannosaurus rex. The display focuses on dinosaurs that evolved in separation in South America, Africa and Madagascar, species new to most North Americans. 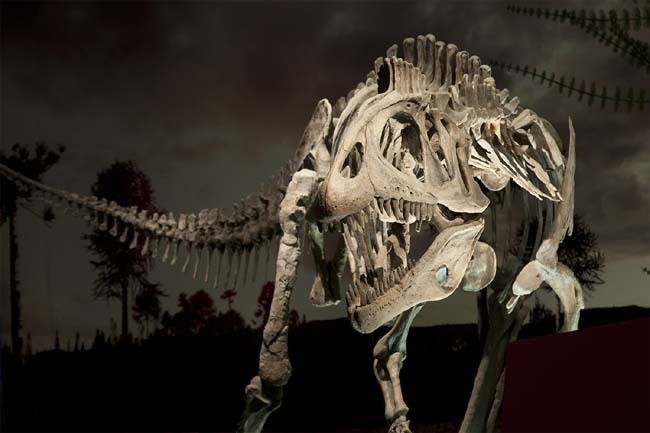 Visitors will learn how geologic history affected the evolution of dinosaurs during the Mesozoic Era, 250 million to 65 million years ago, and why these southern dinos are different from their northern brethren. Millions of years ago, the massive landmass of Pangaea broke into Laurasia in the north and Gondwana in the south. As the continents drifted apart, early dinosaurs were separated and evolved independently in different regions. Among the dinosaurs in the exhibit are the big South American carnivore Giganotosaurus, the nearly 7,000-pound Suchomimus found in what's now the Sahara Desert in Niger, and Cryolophosaurus from Antarctica, who sported a pompadour head crest. The research of Macalester College professors Ray Rogers and Kristi Curry Rogers is highlighted in a couple of dinosaurs from Madagascar. In the 1990s, while Curry Rogers was a paleontologist at the Science Museum, she discovered a new plant-eating dinosaur that she named Rapetosaurus, after the mischievous Malagasy folklore giant, Rapeto. As an adult, Rapetosaurus may have been up to 60 feet long. The exhibit also will include video games, hands-on activities and visual technologies to help visitors understand what these creatures might have looked like and how they moved. The 2007 documentary "Dinosaurs Alive!" will run concurrently in the museum theater. It follows fossil hunters in New Mexico and China's Gobi Desert. St. Paul will be the second stop for "Ultimate Dinosaurs" in the United States, following its current run in Cincinnati. Group and school tickets are on sale now. Individual tickets go on sale this winter.